Laminated with 3M High Intensity Prismatic (HIA) reflective sheeting for high visibility both day & night. For use in places of business, office parks, schools, private and public parking areas, roads, traffic lights, crosswalks, intersections or where ever the posting of of a pedestrian crossing sign is needed. 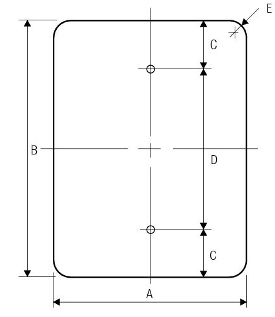 9" x 12" 9" 12" 1" 13" 1"
Pedestrian Crossing signs may be used to limit pedestrian crossing to specific locations. 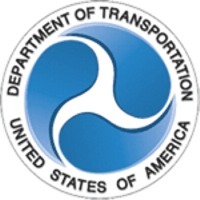 See MUTCD Figure 2B-26. for more details. One of the most frequent uses of the Pedestrian Crossing signs is at signalized intersections that have three crossings than can be used and one leg that cannot be crossed. 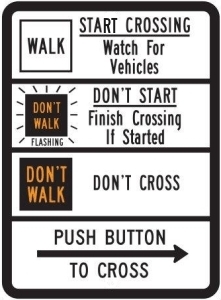 R10-3c is shown as identical to the R10-3b sign except the walking person sign in the top section is replaced by a white square with the word "WALK" in black, the upraised hand in the second section is replaced by a black square with the words "DON'T WALK" in orange and labeled "FLASHING," and the upraised hand in the third section is replaced by a black square with the words "DON'T WALK" in orange.